Take oil in a pan and when hot put the cloves, cinnamon and onions and fry till the onion is soft and light brown, add the scrapped coconut and fry till it turns light brown and you get the right fragrance. Switch off the fire now to the coconut add, jeera,, pepper, coriander powder, red chili powder garlic, tamarind, jaggery and coarse grind in the mixer without water. To the paste add turmeric powder and salt. Wash the brinjals and make two cuts into each one so that the paste can be stuffed into them. Don’t remove the stems but you can trim them so that they are not too long. Then stuff a small amount of the paste into all the brinjals and put them aside. Heat a non-stick kadai with about 2 tbsp of oil. Then add the brinjals to the kadai.let them cook for a few minutes with a lid on under medium flame(5 mins). Cook them on both sides.then check if they are cooked. if they are still not cooked you can add a little water and cook for a few minutes. 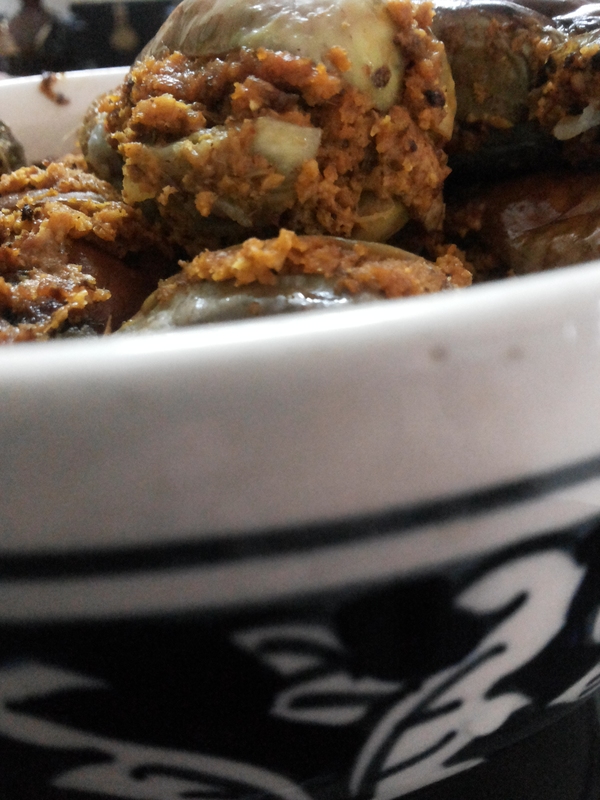 Once the brinjals are cooked add the remaining paste to the kadai and mix well. Let them cook for another 10 mins till the oil comes out.